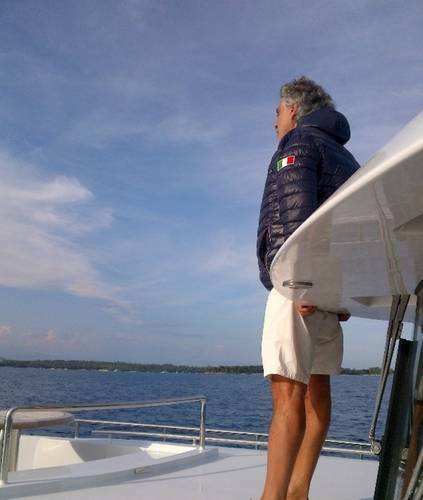 Gamma Yachts has built its most customized Gamma 20 so far, with smart design from Vripack, to opera singer Andrea Bocelli. Gamma Yachts announced the delivery of 22.1-meter M/Y Libertas, the third in its Gamma 20 ‘mini’ super yacht series. With design by Dutch company Vripack, the yacht has impressive guest space for its length overall as well as excellent fuel efficiency, the builder said. Built and designed in Holland, the yacht combines the precision and technical capabilities of the Dutch with world-class interior furnishings and materials from Italy. Although the traditional threshold for a super yacht starts at 30m in length, Gamma Yachts CEO Guido Bonandrini comments that the degree of customization available to an owner in the Gamma 20 is much closer to that of a super yacht than any other vessel in this size range. “The main elements of the Gamma 20 that are dictated to a client are the hull and superstructure shape; almost all other aspects can be adapted to the client’s tastes, much like you would expect on a yacht of a larger size. Particularly to the exterior fly bridge, we have seen major variations in each of the vessels delivered so far. The owner of M/Y Libertas, celebrated opera singer Andrea Bocelli, took the customization even further than the previous Gamma 20 customers,” Bonandrini said. For the yacht’s exterior, Bocelli specified a table and sofa to be placed forward the wheelhouse to offer true immersion into the surroundings, particularly when underway. There is also a custom-built diving board on the extended fly bridge to jump off the uppermost point of the yacht, and the hull is painted in a metallic electric blue. The decking comes in teak as standard and there is an optional hydraulic swim platform that lowers into the water at the stern. Making full use of the volume provided by the bow, the Gamma 20 offers a quarter for two crewmembers plus 170 square meters of living space including the lower deck, main deck, fly bridge and walk-around. The addition of a fourth cabin in this yacht increases the accommodation up to nine guests. Furthermore, the windows in the master cabin have been increased to let in more light. Double-glazing insulates the interior, allowing the piano and recording studio equipment to be used in the main salon. For the interior finishes, the owner chose matte oak paneling with natural oak floors. The galley is outfitted with white Parapan and a grey stained oak flooring. The designers from Vripack performed testing and modeling to ensure the Gamma 20 matches up to the expectations of an owner looking for a super yacht experience in a more compact vessel. 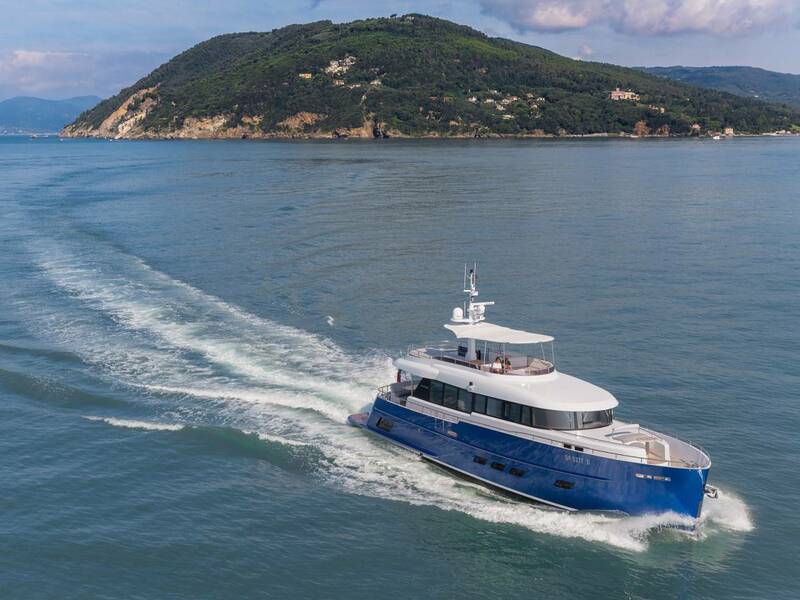 Vripack worked on the noise and vibration testing with Dutch firm Van Cappellen Consultancy, which also provided the insulation; and stabilizers from Naiad offer guests equal comfort whether at anchor or docked in a marina. As well as adding additional space for crew accommodation forward, the bow shape also provides excellent fuel economy for the yacht, which has a range of 1,270 nautical miles on 5,500 liters of fuel. “The Gamma 20 has more to her than meets the eye. Below the curvaceous shape lies a luxury yacht concept that we approached with our holistic design philosophy. We believe that a great boat functions as a whole instead of a loose combination of separate parts,” said Marnix Hoekstra of Vripack. The yacht was constructed and delivered in 10 months. A larger model of 26m, the Gamma 24, is also available in the series, with accommodation for up to 12, with design based on the principle features of the Gamma 20.